Under the GST regime, Customs duties will be exempted on imports made under export promotion schemes namely EPCG, DEEC (Advance License) and DFIA. IGST and Compensation Cess will have to be paid on such imports. The EXIM scrips under the export incentive schemes of chapter 3 of FTP (for example MEIS and SEIS) can be utilised only for payment of Customs duties or additional duties of Customs, on items not covered by GST at the time of import. The scrips cannot be utilized for payment of Integrated Tax and Compensation Cess. Similarly, scrips cannot be used for payment of CGST, SGST or IGST for domestic procurements. 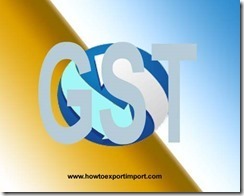 Is GST payable on sale of Bore? Any attracted of GST on sale of clementines? Should I need to pay GST on sale of Fresh Milk? What is the rate of GST on sale of limes? SATHEESH : On 13 July 2017 UNDER GST REGIME WHAT ABOUT THE TAX RATE ON SALE OF LICENCES I.E. EPCG & DEPB ETC. Sec 15 of UTGST Act, Constitution of Authority for Advance Ruling.